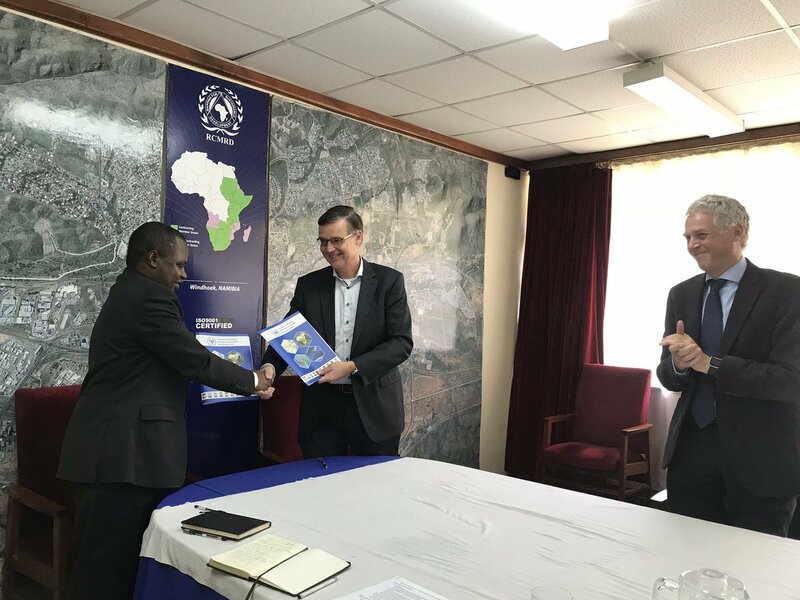 A new partnership between RCMRD and the University of Twente has been signed. The agreement between the two parties was signed on Thursday 1 November in Nairobi, Kenya. The scientific collaboration between the RCMRD programs among them the SERVIR Eastern and Southern Africa program and the University’s Faculty of Geo-Information Science and Earth Observation (ITC) will help more people in RCMRD member States and beyond harness the power of Earth observations and geospatial technologies to solve problems, improve lives and prepare for the future. The two instutions identified areas of synergy as follows: Agriculture and Food Security, Water Resources and Hydroclimatic Disasters, Land Cover and Land Use Change and Ecosystems and Weather and Climate as well as Spatial Environmental Resource Dynamics, Spatial Environmental Quality and 4D Earth Component (Disaster Risk management: the impact of the rapidly growing world population manifests itself in an increasing demand for scarce earth resources and energy, leading to climate change and an increase in the frequency and impact of natural disasters. Focal areas are multi-hazard assessment of risk and vulnerability, disaster risk reduction). RCMRD Director General Dr. Emmanuel Nkurunziza signed the new MOU. Prof. John Kiema the Director for Technical Services Department, Dr. Robinson Mugo the SERVIR-ESA Project Manager, Mr. Degelo Sendabo the GMES East Africa Team Leader at RCMRD, Anastasia Wahome the SERVIR-ESA Science and Data Lead and Mr. Vincent Mtaroni among others witnessed the signing of the new agreement. Prof. Thom Palstra, rector magnificus at the University of Twente, Prof. Tom Veldkamp, dean of the ITC Faculty of Geo-information Science and Earth Observation of the UT and Drs. Tom.M. Loran the Manager Capacity Development and Coordinator International Cooperation,Faculty of Geo-Information Science and Earth Observation (ITC) attended the kick-off event. The modalities include designing and developing new training in thematic areas, implementing training courses, identifying research and developing synergies, performing applied research and development activities in thematic areas, performing collaborative projects, working together to explore application, tools, and service development opportunities and meeting periodically to define and document specific implementation objectives. Further, internships, staff exchange and staff development opportunities for Master and PhD were agreed upon. Leaders from both groups met on November 1, 2018 at RCMRD in Nairobi to kick off the cooperative agreement. The University of Twente, a public research university located in Enschede, Netherlands - aims to bridge some of the capacity gaps at RCMRD. 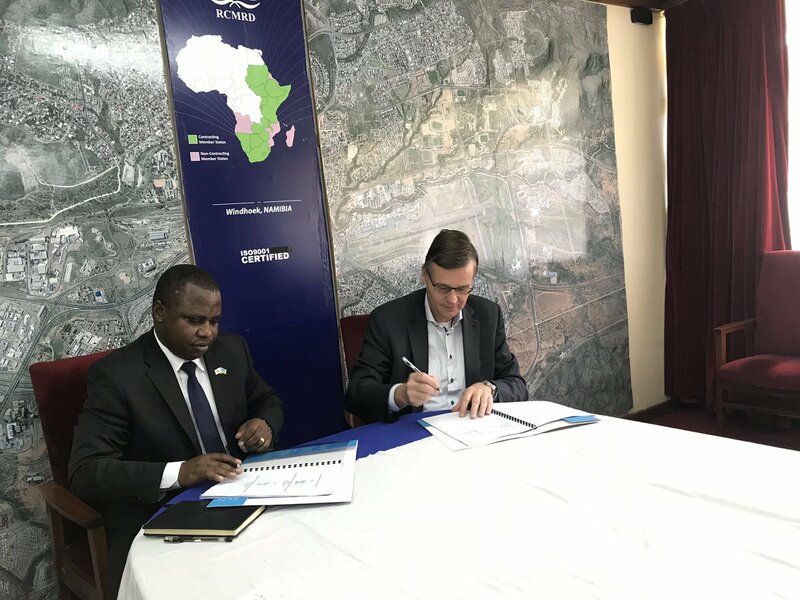 The Regional Centre for Mapping of Resources for Development (RCMRD) whose mission is to promote the use of geo-information in sustainable development in Africa uses a partnership strategy to achieve its mission. The strategy entails collaborating with international, regional and nation institutions and organizations as well private sector in addressing the constraints of access to data,information, knowledge and understanding about the environment and natural resources. Partnerships are usually established through identification and initiation of discussions with prospective partners as regards to agreement on areas and modalities of collaboration. This is then formalized through signing of a Memorandum of Understanding (MOU) whose implementation is evaluated and monitored periodically.